The Horror Movie BBQ: Teen Titans Hit BluRay! Booyah! I'm having a hard time believing that 2018 marks the 15th anniversaries of so many movies or tv shows that I love so much, but that's the way it goes. 2003 was a great year for pop culture, but especially cartoons! And if you were a fan of the DC universe, you were hit with some amazing cartoons! Teen Titans made it's debut on Saturday July 19th 2003 and left an almost immediate impact on it's audiences young and old. The animation, the writing, the great blending of humor and action really brought in people who most likely never would have watched a show like it before. Kids were falling in love with the characters and even finding a character or two to relate to, which became a huge asset to the series as it continued to air. It's audience became rabid and quite loyal to the series, so much so, that you'll find fans continue to reminisce about it in a very loving manner. It's great to know that an entire generation was exposed to these characters thanks to a wonderful series. Even better, it lead to the amazing Teen Titans Go! program, a show that is on equal ground in terms of entertainment and joy. Which, what else can you expect from a group of teenage crimefighters? The dvd's have gone out of print sadly and for years, fans would have to rely heavily on reruns or trying to seek out an old dvd release or two. But good news, Titans Fans! YES! Warner has given us the first season in crystal clear, hidef, bluray. All 13 fan favorite episodes on bluray for the first time! The animation, which was impressive already looks even better thanks to a beautiful transfer that brings out the colors and fun of the show even more. Looking to upgrade from your scratched up, worn out dvd? Good! 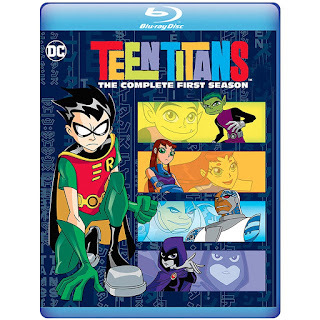 This bluray features all the episodes from the first season and features some great features including a making of, a Puffy Ami Yumi music video, a look at the voice actors and more! Also, it's hard to have a sick day and continue to feel bad after marathon-ing this show. I definitely recommend picking this up and watching the heck out of it. Now, sit back and enjoy the great series! Preferably with pizza or waffles.